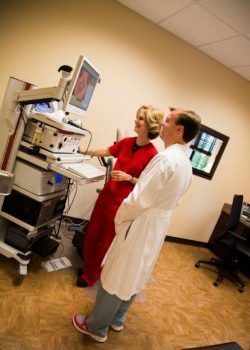 Fiberoptic Endoscopic Evaluation of Swallowing (FEES) provides an endoscopic view of the food/liquid moving through the throat. A very small endoscope is placed in the patient’s nose going down to an area just above the patient’s throat and larynx/upper airway. At this vantage point the speech-language pathologist evaluates the timing, speed, and coordination of food or liquids that are swallowed. Postural changes, food consistency and swallowing techniques/maneuvers can be tried during the FEES to determine the effect of swallow function and whether or not these strategies improve the individual’s ability to safely eat by mouth. Swallowing techniques and positional changes may be tried during this evaluation giving the patient visual feedback on the problem and what he/she can do to improve it. The speech-language pathologist may provide therapeutic interventions and diet recommendations following the FEES evaluation.